Sudden cardiac death is a leading public health problem in our country and in our community. Many advances have been made in the technology and approach to saving lives when people experience cardiac arrest. We have more work to do, however, in raising public awareness about this life-saving technology. Automatic external defibrillators (AEDs) have saved the lives of young people and adults in our community over the past several years. But more lives been unnecessarily lost because AEDs are not widely available and because many laypeople are simply not comfortable using them. Some people also fear possible liability if they fail in their attempts to save a life. Now is the time for us to educate ourselves, and our family, friends, and co-workers about cardiopulmonary resuscitation (CPR) and the value of AEDs in saving lives and improving the outcomes of people suffering cardiac arrest. This is natural, unpredictable death from cardiac causes. Cardiovascular collapse occurs within one hour of the onset of symptoms. Biological death will ensue within minutes without life-saving interventions. How common is sudden cardiac death? An estimated 300,000 to 400,000 people a year succumb to sudden cardiac death. Over the age of 35, the annual risk for sudden death is one person in 1,000. Only 26 percent of them get CPR, which buys them time until a defibrillator can arrive. Only 2 percent get defibrillated. Survival to discharge from the hospital ranges from 1 to 5 percent. What is an automatic external defibrillator (AED) and when is it used? An AED is a self-contained device. It bears little resemblance t0 what you see in the emergency room. AEDs are designed to be available in the community for the public to use in an emergency, to facilitate the prompt treatment of cardiac arrest. When a person collapses due to cardiac rhythm problems, it is critical to be treated within minutes to prevent brain damage and death. 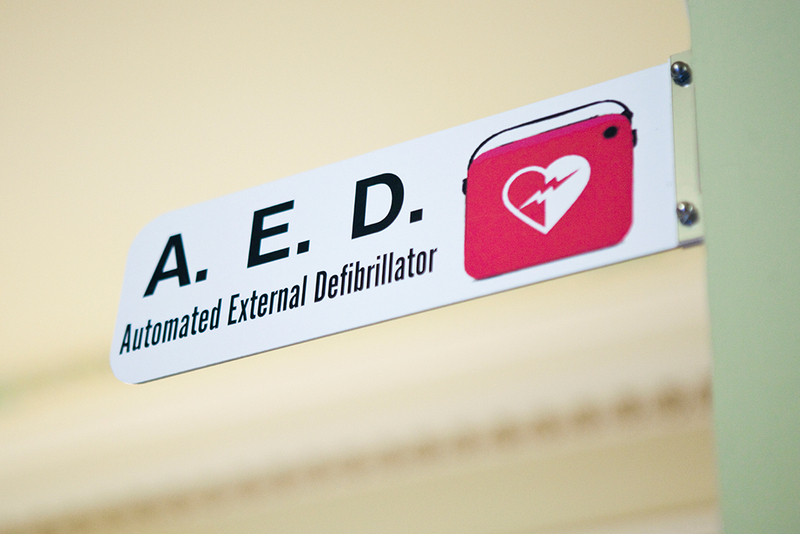 AEDs facilitate life-saving treatment in places where people gather, such as shopping malls, grocery stores, restaurants, airports, casinos, and sporting events. How do I use an AED? Automatic external defibrillators are very sophisticated, yet very simple for a layman to operate. Most AED models turn on when you open them and a voice in the device will prompt the user to follow a few simple steps. The first step involves attaching self-stick pads to the victim. The machine then analyzes the heart rhythm and instructs you verbally whether or not a shock to the heart is required. If a shock is required, the machine then instructs everyone to stand clear and asks the operator to push a button, which delivers the treatment. The AED reanalyzes the heart rhythm and advises if any further action is necessary. There are no gauges, screens, or measurements the operator must know how to use. Essentially, the AED reduces this life-saving intervention to simply opening the case, listening to instructions, and pushing a button. Dr. Mauser is board certified in cardiovascular disease and a Fellow of the American College of Cardiology. He is a member of the medical staff of Cayuga Medical Center and is in practice with Cayuga Cardiology, located at the Island Health Center, Suite 4, 310 Taughannock Blvd. in Ithaca, where he can be reached at (607) 269-0100.